Figure 9.4 shows the general features of the LSP System. Pairs of power bases on opposite limbs of the moon convert dependable solar power to microwaves. The Earth stays in the same region of the sky as seen from a given power base on the moon. Thus, over the course of a lunar month, pairs of bases can continuously beam power toward collectors, called rectennas, on Earth (shown in the lower right of Figure 9.2). Rectennas are simply specialized types of centimeter-size TV antennas and electric rectifiers. They convert the microwave beam into electricity and output the pollution-free power to local electric distribution systems and regional grids. Rectennas are the major cost element of the LSP System. Figure 9.4 greatly exaggerates the size of the rectenna depicted by the circle in Brazil. The LSP system shown in Figure 9.4 may include three to five hours of power storage on the Moon or on Earth. This LSP system is projected to provide cheaper and more reliable power than can solar installations on Earth. The LSP System (Ref) is a more advanced reference system that includes solar mirrors in orbit about the moon (LO). The LO mirrors are not shown in Figure 9.4. 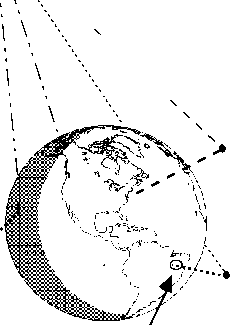 The LSP system (Ref) also includes microwave "orbital redirector or reflector" satellites in moderate altitude, high inclination orbits about Earth (EO) that are shown in Figure 9.4. EO relays will redirect LSP beams to rec-tennas on Earth that cannot directly view the power bases. The rectennas can be decreased in area compared to the LSP system described in the paragraph above. The LSP system (Ref) will very likely include sets of photovoltaics across the limb of the moon from each power base (X-limb). These X-limb stations are not shown in Figure 9.4. Figure 9.4 Schematic of the lunar solar power system. (1993). Using 1980s technology, the LSP System can output 20 TWe by occupying ~25% of the lunar surface. Technologies likely to be available relatively early in the 21st century allow the LSP system to output 20 TWe while occupying only 0.16% of the lunar surface. Energy from LSP is projected to be less costly than energy from all other large-scale power systems at similar levels of power and total energy output. An electric energy cost of less than 1 0/kWe-h is projected for the mature system (Criswell and Waldron, 1990) and lower costs are conceivable. LSP with redirectors in Earth orbit can provide load-following power to rectennas located anywhere on Earth. The LSP System is an unconventional approach to supplying commercial power to Earth. However, the key operational technologies of the LSP have been demonstrated by NASA and others at a high technology readiness level (TRL > 7). TRL = 7 denotes technology demonstrated at an appropriate scale in the appropriate environment (Criswell, 2000). Power beams are considered esoteric and a technology of the distant future. However, Earth-to-Moon power beams of near-commercial intensity are an operational reality. 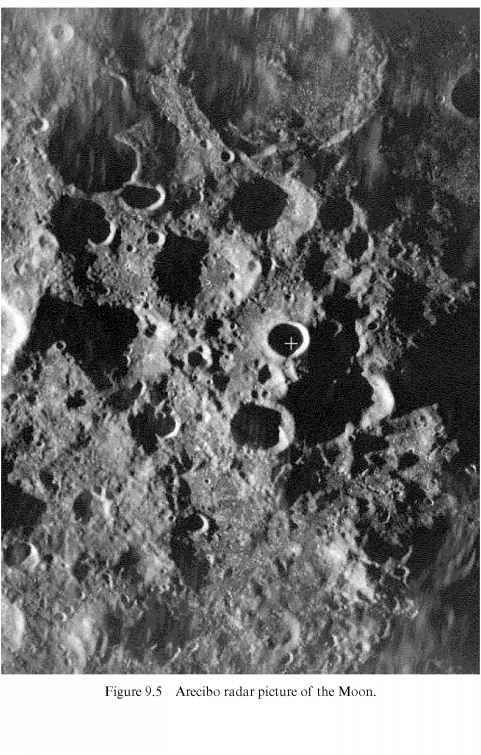 Figure 9.5 is a picture of the South Pole of the Moon that was taken by the Arecibo radar in Puerto Rico. This technique is used for mapping the Moon, determining the electrical properties of the lunar surface, and even examining the polar regions for deposits of water ice (Margot et al., 1999). The Arecibo beam passes through the upper atmosphere with an intensity of the order of 20-25 W/m2. The LSP System is designed to provide power beams at Earth with intensities of less than 20% of noontime sunlight (<230 W/m2). Lower intensity beams are economically reasonable. The intensity of microwaves scattered from the beam will be orders of magnitude less than is allowed for continuous exposure of the general population. Load-following electrical power, without expensive storage, is highly desirable. Earth orbiting satellites can redirect beams to rectennas that cannot view the Moon, and thus enable load-following power to rectennas located anywhere on Earth. Rectennas on Earth and the lunar transmitters can be sized to permit the use of Earth-orbiting redirectors that are 200 m to 1000 m in diameter. Redirected satellites can be reflectors or retransmitters. The technology is much more mature than is realized by the technology community at large. 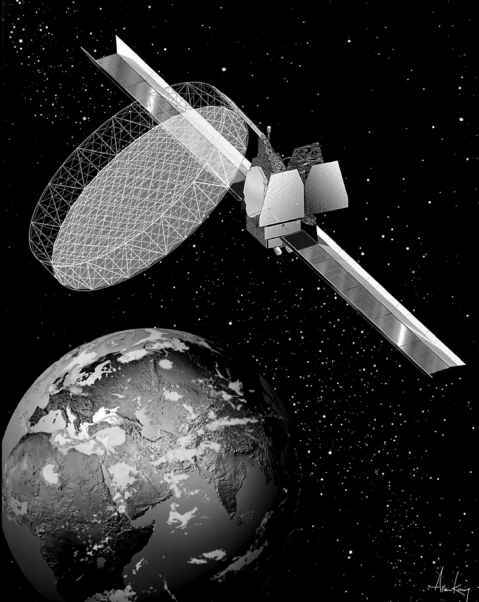 Figure 9.6 is an artist's concept of the Thuraya-1 regional mobile communications satellite [operated by Thuraya Satellite Telecommunications Co. Ltd. of the United Arab Emirates which was placed in orbit in October 2000 (permission: Boeing Satellite Systems, Inc.)]. The circular reflector antenna is 12.25 m in diameter. C. Couvault (1997) reported that the US National Reconnaissance Office has deployed to geosynchronous orbit a similar, but much larger, "Trumpet" satellite. The Trumpet reflector is reported to be approximately 100 meters in diameter. The Trumpet reflector, only a few tons in mass, has a diameter within a factor of three of that necessary to redirect a low-power beam to a 1 km diameter or larger rectenna on Earth. Power beams and redirector satellites can minimize the need for long-distance power transmission lines, their associated systems, and power storage. Figure 9.6 Concept of NRO trumpet satellite. Shuttle, the beam has an intensity of the order of 150 W/m2. This is well within the range for commercial transmission of power (Caro, 1996). Figure 9.7 Shuttle synthetic aperture radar. of solar mirrors in orbit about the Moon can reflect solar power to selected bases during eclipses and during sunrise and sunset. These solar reflectors, actually types of solar sails, will be far less expensive, per unit area, to build and operate than high-precision reflectors such as those in Figure 9.6. The lunar portion of an LSP System prototype Power Base is depicted in Figure 9.8. A Power Base is a fully segmented, multi-beam, phased array radar powered by solar energy. This demonstration Power Base consists of tens to hundreds of thousands of independent power plots. A demonstration power plot is depicted in the middle to lower right portion of the figure. A mature power plot emits multiple sub-beams. A power plot consists of four elements. There are arrays of solar converters, shown here as north-south aligned rows of photovoltaics. Solar electric power is collected by a buried network of wires and delivered to the microwave transmitters. 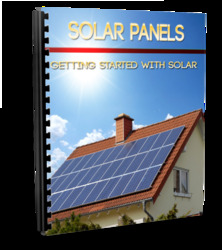 Power plots can utilize many different types of solar converters and many different types of electric-to-microwave converters. 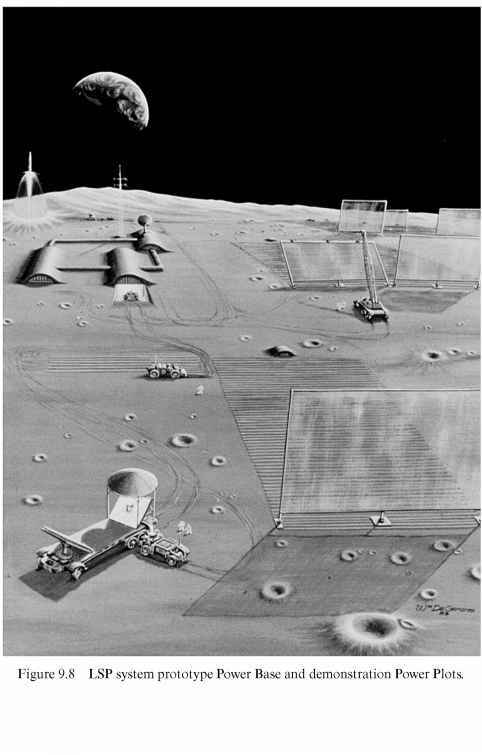 In this example the microwave transmitters are buried under the mound of lunar soil at the earthward end of the power plot. Each transmitter illuminates the microwave reflector located at the anti-earthward end of its power plot. The reflectors overlap, when viewed from Earth, to form a filled lens that can direct very narrow and well-defined power beams toward Earth. The Earth stays in the sky above the Power Base. Extremely large microwave lenses, the circles on the Moon in figure 9.2, are required on the Moon to direct narrow beams to receivers (>0.5 km diameter) on Earth. Large lenses are practical because of fortuitous natural conditions of the Moon. The same face of the Moon always faces Earth. Thus, the many small reflectors shown in Figure 9.8 can be arranged in an area on the limb of the moon so that, when viewed from Earth, they appear to form a single large aperture. The Moon has no atmosphere and is mechanically stable. There are virtually no moon quakes. Thus it is reasonable to construct the large lens from many small units. Individually controllable sub-beams illuminate each small reflector. The sub-beams are correlated to combine coherently on their way toward Earth, to form one power beam. In the mature power base there can be hundreds to a few thousand sets of correlated microwave transmitters. These arrangements of multiple reflectors, likely including additional subreflectors or lenses in front of each main reflector, and transmitters form a fully segmented multibeam phased array radar. and Waldron, 1993). Factories, fixed and mobile, are transported from the Earth to the Moon. High output of LSP components on the Moon greatly reduces the impact of high transportation costs of the factories from the Earth to the Moon. On the Moon the factories produce hundreds to thousands of times their own mass in LSP components. Construction and operation of the rectennas on Earth constitute greater than 90% of the engineering costs. Using lunar materials to make significant fractions of the machines of production and to support facilities on the Moon can reduce up-front costs (Criswell, 1995a). Personnel in virtual work places on Earth can control most aspects of manufacturing and operations on the Moon (Waldron and Criswell, 1995). An LSP demonstration Power Base, scaled to deliver the order of 0.01 to 0.1 TWe, can cost as little as 20 billion dollars over ten years (Criswell and Waldron, 1993; Glaser et al., 1998, Ch. 4.11). This assumes the establishment of a permanent base on the Moon by one or more national governments that is devoted to the industrial utilization of lunar resources for manufacturing and logistics. Such a base is the next logical step for the world space programs after completion of the International Space Station. LSP is practical with 1980s technology and a low overall efficiency of conversion of sunlight to power output on Earth of —0.15%. Higher system efficiency, >35%, is possible by 2020. An LSP System with 35% overall efficiency will occupy only 0.16% of the lunar surface and supply 20 TWe to Earth. Also, greater production efficiencies sharply reduce the scale of production processes and up-front costs. There are no "magic" resources or technologies in Figure 9.8. Any handful of lunar dust and rocks contains at least 20% silicon, 40% oxygen, and 10% metals (iron, aluminum, etc.). Lunar dust can be used directly as thermal, electrical, and radiation shields, converted into glass, fiberglass, and ceramics, and processed chemically into its elements. Solar cells, electric wiring, some micro-circuitry components, and the reflector screens can be made from lunar materials. Soil handling and glass production are the primary industrial operations. Selected micro-circuitry can be supplied from Earth. Unlike Earth, the Moon is the ideal environment for large-area solar converters. The solar flux to the lunar surface is predicable and dependable. There is no air or water to degrade large-area, thin-film devices. The Moon is extremely quiet mechanically. It is devoid of weather, significant seismic activity, and biological processes that degrade terrestrial equipment. Solar collectors can be made that are unaffected by decades of exposure to solar cosmic rays and the solar wind. Sensitive circuitry and wiring can be buried under a few to tens of centimeters of lunar soil and completely protected against solar radiation, temperature extremes, and micrometeorites. The United States has sponsored over 500 million dollars of research on the lunar samples and geophysical data since the first lunar landing in 1969. This knowledge is more than adequate to begin designing and demonstrating on Earth the key lunar components and production processes. Lunar exploration is continuing. The DoD Clementine probe and the Lunar Prospector (lunar.arc.nasa.gov; Science, 266: 1835-1861, December 16; Binder, 1998) have extended the Apollo-era surveys to the entire Moon. LSP does not have the mechanical directness of SSPS. To achieve the lowest cost of energy the LSP System needs microwave orbital redirectors about the Earth. Compared to an SSPS the specific mass of beam redirectors can be very low for the power they project to the rectenna. This is because the LSP orbital redirectors can achieve far higher efficiency in retransmitting or reflecting microwaves than can an SSPS in converting sunlight into microwaves. Also, the LSP microwave reflectors can be much smaller in area than an SSPS that transmits an equal level of power. This is because the LSP orbital unit can be illuminated by microwave beams in space that are more intense than solar intensity. LSP requires the smallest amount of terrestrial equipment and final materials of any of the power systems, as can be seen from line 7 of Table 9.7.
water and geography were gifts of nature that minimize the amount of earth that must be moved and enable the smallest possible dams. The Moon provides the solid state equivalent of a "natural watershed" for the 21st century. It is there, correctly positioned, composed of the materials needed, and lacking the environment of Earth that is so damaging to thin-film solid-state devices. The General Dynamics-Convair models for construction of space solar power satellites from lunar materials (refer to section 9.2 and Figure 9.3) were adapted to modeling the construction of the Lunar Solar Power System (Criswell and Waldron, 1990). Use of the Moon eliminates the need to build extremely large platforms in space. LSP components can be manufactured directly from the lunar materials and then immediately placed on site. This eliminates most of the packaging, transport, and reassembly of components delivered from Earth or the Moon to deep space. There is no need for a large manufacturing facility in deep space. This more focused industrial process reduces the fleet of rockets necessary to transport components, manufacturing facilities, and people from Earth to space and the Moon, compared to the General Dynamics-Convair model. If the LSPS and LSP use similar technologies for deployment, manufacturing, and operations in space and on the Moon, LSP power capacity can be installed at —50 times the rate of LSPS for similar levels of expenditures over similar times. Higher LSP System emplacement rates are conceivable with future operating technologies, higher levels of automation of the production process, and use of lunar materials to build the more massive elements of production machinery (Criswell and Waldron, 1990; Criswell, 1998c). The higher production efficiencies and lower cost of LSP support the assertion that the LSP System is the only likely means to provide 20 TWe of affordable electric power to Earth by 2050 (Table 9.6, Row 23). Figure 9.9 illustrates the growth of power transmission capacity on the Moon (power units). The installation units, which are the mobile units in Figure 9.8, are initially transported to the Moon and produce and emplace the power plots that are termed power units in Figure 9.8. As experience is gained, an increasing fraction of installation units can be made on the Moon by manufacturing units that primarily use lunar resources. Manufacturing units might be contained in modules deployed from Earth such as are depicted in the middle-left of Figure 9.8. Power unit production can be increased without significantly increasing the transportation of materials from Earth (Criswell, 1998c). The long life and increasing production of power units enable an "exponential" growth in LSP transmission capacity and similar growth in the delivery of net new energy to Earth. Development of manufacturing units and the extensive use of lunar materials is considered to be a reasonable goal (Bekey et al., 2000). 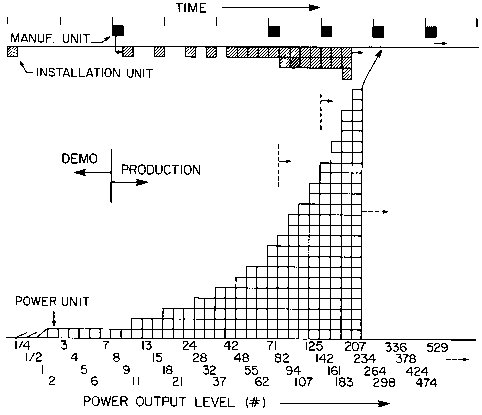 Figure 9.9 Exponential growth of LSP System power output from the Moon. Table 9.8 compares estimated "median" life-cycle costs of five power systems scaled to provide 1500 TWe-y of energy. The costs are given in trillions (1 T = 1 X1012) of US dollars. The estimates are based on studies of systems utilizing 1990s levels of technology (Criswell, 1997,1997a, 1997b; Criswell and Thompson, 1996). The major cost categories are capital, labor, fuel, and waste handling and mitigation. Nominal costs for labor, capital, and fuel are taken from 1980s studies of advanced coal and nuclear plants (Criswell and Thompson, 1996). TTSP - Terrestrial thermal solar power. TSPS - Terrestrial solar photovoltaic power. LSP(Ref) - Lunar Solar Power System with beam redirectors in orbit about Earth and solar reflectors in orbit about the Moon. LSP(X-limb) - LSP System with fields of photovoltaics across the lunar limb from each power base, no solar reflectors in orbit about the Moon, and three hours of electric storage capacity on Earth. LSP(no EO) - Similar to LSP(X-limb) but no redirectors in orbit about Earth and at least 18 hours of electric power storage capacity on Earth. verted to electric energy. To a first approximation, this doubles the cost of the capital equipment to 380 T$ for 4500 TWt-y. The Table 9.8 estimate of capital costs of ~570 T$ (for fossil only) or 713 T$ (for fission only) assumed 1980s levels of technology and no technology advancement during the 21st century. Case A2 assumes far higher costs for fossil fuels, ~830 T$, than the ~243 T$ assumed for the nominal case in Table 9.8. Externality cost, corresponding to wastes costs in Table 9.8, of —913 T$ for coal are comparable to the —800 T$ in Case A2 where externality cost is assumed to be proportional to the price of the fossil fuel. The costs of coal and fission plants are dominated by "waste" handling, which includes estimates of damage to human health and to the environment of the entire fuel process (mining to burning to disposal). The cost estimates in Table 9.8 assume that TTSP(thermal) and TPSP(photovoltaic) systems are scaled to storage energy for only 1 day of local operations. These systems must be scaled up considerably to feed power to a global network of power lines. Analyses provided by Klimke (1997) indicate that the delivery 1500 TWe-y would cost the order of 10000 T$. Power storage is not included in the estimated cost of the global system. The LSP (Ref) System is the lowest in cost. It uses reflectors in orbit about the Moon to illuminate the power bases during eclipses of the Moon by the Earth. It also uses redirectors in orbit about Earth to provide load-following power to any rectenna on Earth. The LSP(Ref) provides 1500 TWe-y at 1/27th the cost of the coal-fired system. The LSP(X-limb) System, column #7 of Table 9.8, does not use solar reflectors in orbit about the Moon. Rather, each power base is provided with a field of photovoltaics across the limb of the Moon. Power lines connect the power base and extra photovoltaics. Energy storage is provided on Earth for 3 TWe-h, and power bases and rectennas are slightly scaled up. The LSP(no EO) is the LSP(X-limb) without redirectors in orbit about the Earth. Approximately 18 TWe-h of power storage is supplied on Earth. Deep-pumped hydro is assumed. The power bases and rectennas are scaled up over the LSP(X-limb) case. Even the LSP(no EO) provides 1500 TWe-y of energy at less cost than conventional coal or fission. The LSP Systems can provide savings of the order of 1000 trillion dollars for the delivery of 1500 TWe-y over coal and the order of 9000 trillion dollars in savings over global solar photovoltaics. Criswell and Thompson (1996) analyzed the effects of changes of a factor of 10 in "waste" handling costs and reasonable variations in the costs of labor, capital, and fuel for coal, advanced nuclear fission, terrestrial solar thermal and photovoltaic, and the LSP(Ref) systems. This prototype analysis found the LSP(Ref) system to be 10 to 16 times less expensive in the delivery of end-user electric power than the closest competitor, coal. New types of mixed systems may enable substantial reductions in costs. Berry (1998: Target Scenario) proposes a power system scaled to supply the United States with —1.3 TWe. Approximately 45% is used directly by end-users. The majority (55%) is used to make hydrogen for transportation vehicles. The primary power sources are wind (0.85 TWe), solar thermal (0.85 TWe), hydroelectric and nuclear (0.15 TWe), and distributed photovoltaics. Energy is stored as hydrogen to be used in load leveling and peaking. See Bockris (1980) for an early but extensive discussion of a hydrogen economy and its technology. A novel aspect of the Target Scenario is to store the hydrogen in the fuel tanks of cars, vans, trucks, building power supplies, and similar power users (Appleby, 1999; Lloyd, 1999). The vehicles are assumed to be connected to the national power grid when not in use. Thus, the capital associated with the transportation fleet and end-use production is also used to provide "prepaid" energy storage facilities. Assuming very low-cost advanced technologies, the simulations project —0.4 T$/TWe-y for the cost of delivering end-use and transportation energy. One thousand TWe-y would cost —400 T$. 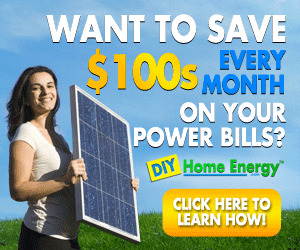 This is —50 times less costly than a stand alone global system of photovoltaics and power distribution. Given reasonable costs for reversible fuel cells, the primary concern becomes accurate knowledge of the longest period of unsuitable weather (cloudy or smoky skies, low winds, etc.) in a region or globally. However, given the complexity of the biosphere, this "longest" duration is essentially unknowable. The LSP System provides a power source that is decoupled from the biosphere and can provide the power as needed through all conditions of fog, clouds, rain, dust, and smoke. Berry's mixed system, or Target Scenario, is ~20 times more costly than the least expensive option of the Lunar Solar Power System. The LSP System, and other systems, could also use the vehicular and other energy storage units of the Target Scenario to reduce costs. Total costs of power for an energy-prosperous world are so enormous that it is difficult to understand their scale and significance. One method is to calculate the simple sum of gross world product (GWP) from 2000 to 2100 under the population assumptions in Table 9.1. For ten years after the oil disruptions of the 1970s GWP/person was ~4,000 $/person-y. Assume an energy constrained 21st century and a constant GWP/person. This sums to 3900 T$. This projected "poor" world simply cannot afford to build and operate terrestrial solar power systems necessary to provide 2 kWe/person by 2050 or 1500 TWe-y by 2100. The world economy will be extremely hard pressed to provide the energy by means of coal and fission as noted in Tables 9.2-9.6. For Case A, Nakicenovic et al. (1998: p. 6), project a global economy that sums to —12000 T$ by 2100. Per capita income is ~4300 $/person-y in 2000 and —30000 $/person-y in 2100. Case A assumes no major "waste" costs for the large-scale use of fossil and nuclear energy. They project —8800 T$ for Case C (mostly renewable energy) between 2000 and 2100. Note that approximately 10% of GWP is now expended on the production and consumption of commercial energy. This corresponds to 240 to 540 trillion dollars between 2000 and 2100. These sums are much smaller than the costs of conventional power systems to supply adequate power. But they are larger than projected for the LSP System. A poor world must remain energy poor if it uses only conventional power systems. However, the less costly LSP System electricity can save money, minimize or even eliminate the pollution associated with energy production, and accelerate the generation of wealth. Why is the LSP so attractive as a large-scale power system? The Sun is a completely dependable fusion reactor that supplies free and ashless high-quality energy at high concentrations within the inner solar system, where we live. The LSP primarily handles this free solar power in the form of photons. Photons weigh nothing and travel at the speed of light. Thus, passive and low mass equipment (thin-films, diodes, reflectors, and rectennas) can collect and channel enormous flows of energy over great distances, without physical connections, to end uses when the energy is needed. The LSP is a distributed system that can be operated continuously while being repaired and evolving. All other power systems require massive components to contain and handle matter under intense conditions, or require massive facilities to store energy. Low mass and passive equipment in space and on the Moon will be less expensive per unit of delivered energy to make, maintain, decommission, and recycle at the end of its useful life than massive and possibly contaminated components on Earth. The Moon is a uniquely suitable and available natural platform for use as a power station. It has the right materials, environment, mechanical stability, and orientation and remoteness with respect to Earth. The major non-terrestrial components of LSP can be made of lunar materials and the large arrays can be sited on the Moon. The rectennas on Earth are simple and can be constructed as needed and begin to produce net revenue at a small size. The LSP can be far less intrusive, both in the physical and electromagnetic sense, than any other large power system. Most of the power can be delivered close to where it is needed. LSP can power its own net growth and establish new space and Earth industries. Finally, all of this can be done with known technologies within the period of time that the people of Earth need a new, clean, and dependable source of power that will generate new net wealth.